Brace yourselves, all: yes, it is. The shelves are crammed and sagging under the weight of lovely new books. The aisles are crammed and bulging with readers, eager to find that perfect book. And through it all, the brave and intrepid booksellers of this nation, making the perfect bookish matches for the holiday season. Yes, it’s the busiest time of the year, but a large troupe of our Shelf Talker professionals made time to give us their picks for the month. And not just a few of our booksellers: this is a special, jumbo-sized, seasonal miracle of a collection, with a little something for everyone. Fiction and non-fiction, adults and kids, graphica and poetry... I swear, my heart has grown three sizes today. "Matt Rader's voice is crystal clear, his vision unwavering, and his storytelling skills are engaging and sophisticated, regardless of the subject he has turned his sights on. READ SHORT STORIES." "Ann-Marie MacDonald's Adult Onset is a heartbreaking novel and left me with a renewed sense of admiration for this author, while at the same time pulling me into the life of the main characters' struggles to love each other despite all of the damages wrought by their past. I will just focus on one of the main themes of the novel here, the one that is most interesting to me, and that is the theme of anxiety and how it impacts those who suffer from it. Anxiety that is the result of childhood trauma, that impacts the day-to-day, minute-by-minute lives of those who suffer from it. Ann-Marie nails it! I have treated anxiety disorders for many years as a therapist and this novel rings so true that it at times is a difficult read. There is also humour here, and the great courage of those who are desperate to rise above the debilitating impact of trauma and make new lives for the next generation. This novel is a testament to all that!" "Ian McAllister's research work in Great Bear Wild, coupled with his award winning photography, have come together in one of the most fascinating and visually appealing books of the year! 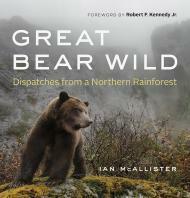 This book is worth it for the photography alone, but McAllister's observations of the Great Bear, its diverse ecosystem, and its importance to British Columbia and the world, really put it over the top. Fantastic if you're looking for a great coffee table book, or if you're looking for some excellent nature writing. I can easily call this one of my favourite non-fiction books of the year." "This was definitely my favourite book of the year—and I’m so glad that the Governor General’s Award judges agreed. In The Back of the Turtle, Gabriel Quinn is a brilliant scientist haunted by the knowledge that his work resulted in an environmental catastrophe that killed many, including members of his own family. He travels to witness the effects of his work and there encounters a determined group of people who wait and plan for the return of life and community to their ruined landscape. Juxtaposed against this story is the tale of a Toronto executive who is more concerned with stock prices, real estate, and domestic discord than the real-life devastation caused by his company. The Back of the Turtle has moments of laughter and pathos, characters who are all the more engaging for their flaws and a storytelling style that keeps you reading long into the night. I would recommend it to readers who enjoyed Green Grass, Running Water, or Michael Crummey’s Galore. "Who hasn't wanted a second chance? At love. To fulfill a dream. 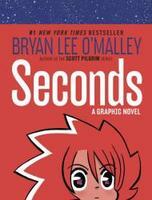 Bryan Lee O'Malley's Seconds shows every iteration of how chef Katie's dream of opening her own restaurant can go both tantalizingly close to perfection and so terribly close to disaster. Colourful, creative, and a perfect read for foodies as well as comic fans." "I can't get enough of this new collection from Vancouver poet Dina Del Bucchia. Hilarious and raw, Blind Items is uncomfortable in the best ways; like a hot pair of stilettos that hurt but make the outfit, or spicy Thai curry that is just ... too ... good to stop eating." "A Year in the Life of a Total and Complete Genius, by Stacey Matson, is a great pick for 9 to 13-year-olds. The story is told in correspondence between the main character, Arthur A. Bean, and his teachers and classmates. Arthur is quite sure he is on the way to becoming a famous author and will win a writing contest and the heart of his true love Kennedy. Arthur is a sweet and funny character and it is a lot of fun to join him on his journey through the ups and downs of junior high." "A founding member of the North West Company, Peter Pond was one of the last 'tough, old-style explorers, who ventured into the wilderness and helped shape the modern world.' Gough uses Pond's memoirs, explorers' journals, and letters to bring this fascinating explorer to life." "On page one an actor dies while performing King Lear on stage and that marks the beginning of the collapse of civilization. Years later, a troupe of actors, musicians, and artists travels the ravaged land performing Shakespeare for whatever settlements they come across. This is a unique and extraordinary novel that you won't be able to put down. It is one of the best books about the calamitous future that I have ever read."